When I collected Aaron from nursery today it was so warm neither of us had a jacket on. Look at the weather we have been experiencing this March already in London (and if you click on that link you will see THIS WEEKEND is set to be EVEN warmer)! As he got near home he was too tired to cycle on his balance bike and asked if he could get the bus. We were only a 5 minute walk from home, but the sun went to my head so I said yes, let's get the bus to the shop at the end of the road (he wanted "yoghurt drink")! Good frugal sense got the better of me and I couldn't justify the cost of the debit on my Oyster Card for 2/3 bus stops, so I said "let's go into town". Except before we got there, I said "do you want to go to the shop where you like the sketty bolognese?" to which he was like "yeah they have toys"! Suffice to say, we went, except as Aaron had just had a big lunch and pudding at nursery he did not touch his food (but he did eat all of the snacks in the snack box all the way home)! It was busier than usual in there (Kiddicare), and I got talking to 3 different Mums, as their child played with Aaron. (Not at the same time, consecutively, so lots of playing, chatting and time passed)! He played so so so nicely I got really good chill out time. On the way out, not having made ANY purchases - I am more than happy to go in there just for good food - I spotted a Thomas Track that was half price (not available online though) and I couldn't resist it. Whilst paying, I explained how I would have LOVED a copy of The Very Hungry Caterpillar in time for World Book Day, and despite my not being able to find it, the very helpful cashier went and found me a copy. It's a SMALL hardback copy, so I kind of hesitated at the ticket price of 6 pounds (especially given that I nearly escaped purchase free) but like the track I could not resist it! Although we only got our OWN copy today, Aaron's been reading The Very Hungry Caterpillar at nursery for a couple of years now. 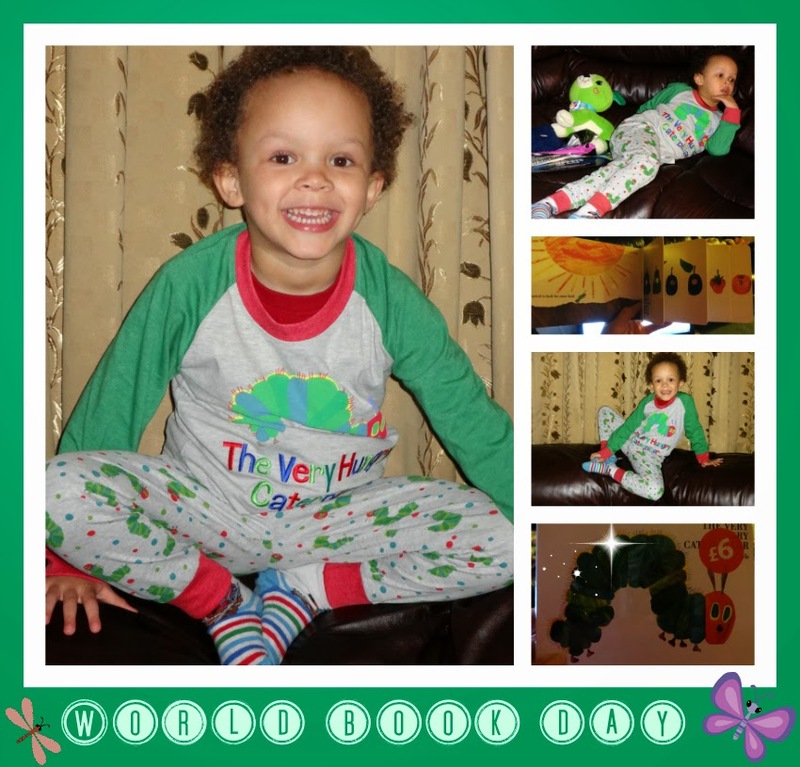 10 days ago, we received 3 pairs of PJs from HouseOfFraser.co.uk. I had deliberately chosen 1 of them as the Very Hungry Caterpillar. I fell in love with the PJs on the site (the other 2 pairs of PJs I chose were in their blue cross Sale and are now out of stock). In the spirit of World Book Day I thought I would tell you what I love about the book (I read it to Aaron 12 times tonight - I read it again and again until he slept). Children love the sun and the moon from a very early age, and the book begins with the moon. An egg appears on a leaf, so the book teaches about birth (of the egg kind). Oviparous animals are animals that lay eggs! Next follows the birth after a warm sunrise on a Sunday morning. Aaron was fascinated by the sun coming up when he was younger. What follows is what the caterpillar eats Monday through to Saturday. I love this as it teaches the early reader days of the week and numbers. It also teaches them to associate the name of the food with the picture of it. Aaron learned his numbers when he was really young, but this is not the same as counting. When he used to point at things he would say 1, 2, 3, 4, 5, 6 and wouldn't steady up to point at the items as he counted. He now does thankfully, but this book would have been a great way to practice that, counting the items eaten, on each day, with each turn of the page. For that reason, I'd say this would be a fabulous early book to get for a 1 to 2 year old, to take them right through to 3-4 years of age. On Saturday the Caterpillar eats far too much and gets a stomach-ache. I actually love this, as I do drill in to Aaron not to eat too many biscuits or chocolate and it's nice that the book backs us parents up on that. I am in to my Super Greens and alkalising and the healthy Caterpillar eats nothing but a "nice green leaf" the Sunday, a week after his birth, and "felt much better". The Caterpillar then builds a cocoon around himself and becomes, after "more than 2 weeks" a "beautiful butterfly". I love this, as I am trying to teach Aaron the concept of time, like "last night, yesterday, a week ago" etc... so it's nice to hear the book say "two weeks", so I can help him to further understand the passing of time. Disclosure: I reviewed HouseOfFraser.co.uk and my PJs for Aaron were in exchange for an honest review. I will be doing a dedicated PJ/bedtime post at a later date. I can highly recommend the website and had a great experience choosing our items. This is a great post, LP loved the Very Hungry Caterpillar too. You're so right about the children learning when you read it to them too, I used to love reading this one. Great post.